There is absolutely no one other than B.L. Bishop Photography that I will use to have photos taken for my family and my business. I am a hairstylist and am more used to working behind the scenes so I was a little nervous about being in the spotlight on my wedding day. She made it so comfortable and easy and made our day absolutely perfect and the photos are gorgeous!!! No one will do a better job. Working with Bertha was an absolute pleasure from start to finish. We had the honor of having her capture our wedding day, and we couldn’t be more pleased. She was easy to work with, flexible, quick to respond to all of our questions, fun, organized and made us feel so much at ease on our big day! Bertha was always on the spot, capturing all the perfect and special moments, and the quality of her work is unmatched. We received many compliments from family members who couldn’t help but notice how organized and effectively she worked. We were on a pretty strict timeline with after-ceremony pictures, but we ended up getting everything we wanted and then some, with time to spare! We are SO lucky to know Bertha, and hope to work with her again in the future! She is great! We loved her and the pictures! She is the best photographer ever! She captured all the amazing moments of the day. She was very responsive and very easy to work with. We are so happy with our pictures! I HIGHLY recommend B.L. Bishop Photography to anyone! The best photographer out there. She is so fun and easy to work with. My wife and I just loved having Bertha work with us. Bertha's assistant and her are very professional and make the picture taking process simple. She also offers a custom made photo album which makes for a great gift for the mothers of the bride and groom. I would highly recommend her for all of your photography needs. I would recommend Bertha time and time again! She is so sweet and extremely talented. She listens to what you want and incorporates it into your pictures. She beautifully photographed our wedding and gave us such sweet memories of our day! Very organized and excited about our day! She was so organized that I was calm the entire wedding day!! She is very creative in her positioning. She is amazing with the wedding party as well. She will do anything to get that shot!! Don't wait or look around at other vendors! B.L. 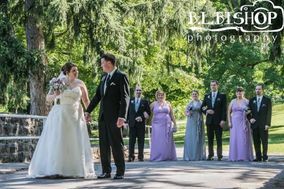 Bishop Photography is the one for you. She will help make your day special and she will capture every special moment! She will take the stress out of having perfect wedding photos...your only worry is how to choose which ones! I hired Bertha for my cousins wedding gift and I am so glad I did! Bertha did both our engagement pictures and wedding photos. They turned out both with such great quality that I proudly display them around my household. I highly recommend her as photographer! Bertha made quality, flexibility and beauty priorities. She listened to us mid-lifers and streamlined the process, price and portraits to what was important to us. We just love them and can't stop looking at them. You get tons of pictures in a showy album. We loved our experience and love Bertha! Bertha was fantastic! She accommodated our schedule both in meeting with us to consult and the day of the wedding. She went above and beyond our expectations in quality and professionalism. Great shots, creative and bossy enough to get the pictures without taking too long, the perfect mix. She worked very well with us to get us exactly what we wanted. Highly recommend her.